Support & discussion regarding DAWs and MIDI sequencers. Same for Outputs. So it's there. However when I type lspci in console, as su, it doesn't show it. That's it for audio devices. - So my first question is, where is it? If Sound in Settings can see it, why is it not listed as a hardware device? Also I don't understand the difference between digital inputs and outputs. I have no digital inputs. A mic input and guitar input. A headphone output and the USB out and phono audio out. So I can understand that it should be digital out for recording, but why is it showing digital in? So I can play sound through the Scarlett solo. Use the volume monitor knob to adjust the sound in and out through the rear audio outs to my speakers using direct monitor switch. I can also playback on my speakers through the PC without the direct monitor on. I can get a signal through the mic input. Audacity sometimes sees it. Sometimes doesn't. I can use the preference playback to hear live. Sometimes it works, but sometimes not. Also Audacity is crashing sometimes. I got this error message once. Latency Correction setting has caused the recorded audio to be hidden before zero. Audacity has brought it back to start at zero. You may have to use the Time Shift Tool (<---> or F5) to drag the track to the right place. So I can't get the stability I need from Audacity to record. Technically I don't need Audacity. Just some recording software. Qjack doesn't detect the Scarlett at all. All I can see is Pulse Audio and under it, System. Nothing in MIDI or ALSA about it. However from Settings the Scarlett can be selected at the interface hw:USB but I still get the same connections as before. No mention of the Scarlett. Any ideas what might be up? Pulseaudio, the default audio server, detects the card, so far so good. So my first question is, where is it? If Sound in Settings can see it, why is it not listed as a hardware device? "Digital" refers to S/PDIF. Maybe alsa and/or pulseaudio are not aware that the Scalett Solo has not S/PDIF but that shouldn't harm. Just ignore it. In audacity's audio preferences, "devices" and "recording" tabs, how is your configuration? Are you using pure alsa, or jack? That looks like a warning, rather than an error. It means what it says. Maybe it is safe to move the cursor to the right one second or two for the start of the recording, so that, if latency compensation nudges back the recorded audio to the left, it all will be OK.
Technically I don't need Audacity. Just some recording software. I suggest ardour. For simple recordings, jack time-machine or jack_capture will do it fine. Jack ignores the vendor and product but that doesn't mean the hardware is not detected. hw:USB seems to be the short name of the Scalett Solo card. Select that as the interface in qjackclt. "System" means the card that jack is using, so, if you selected hw:USB device, "system" is the Scalett. As this card has not MIDI capabilities JACK MIDI (midi tab) and ALSA MIDI (alsa tab) are blank. You are only interested in the "audio" tab, where the system captures correspond to the Scarlett inputs and the system:playbacks correspond to the Scarlett outputs (again, assuming jack was started via qjackctl with the hw:USB interface, of course). That explained a lot. Really top notch reply. I have gotten more things working this way! I'm about to buy one too. I know the Scarlett 2i2 is working perfectly on Linux. But for the Solo it's the first review I've seen... I suppose it should work too, under Linux Mint (in Reaper daw). Scarlett Solo (2n gen), 2i2 (1st gen) and 2i4 (2nd gen) run fine here. But as many other class compliant interfaces they run best at multiples of 48000 Hz. At 44100 Hz I can hear some clicks from time to time, so I run them at 48000 Hz. bulevardi wrote: I know the Scarlett 2i2 is working perfectly on Linux. They've got the same DAC and controller with Solo, you shouldn't encounter any problems using it. However, messy software setups done by people who never read the docs are always problematic. Super, thanks for letting me know. I found the solution in the Help Center of Focusrite's website, and apparentl you have to select the second input. "If you are having some trouble getting your D.A.W (recording software) to record this signal, it is likely to be becuase the track you are recording on to is set to record off the 1st input of the Scarlett Solo, rather than the 2nd (which is where your guitar will be plugged into). By default, audio tracks will be set to record off input 1. 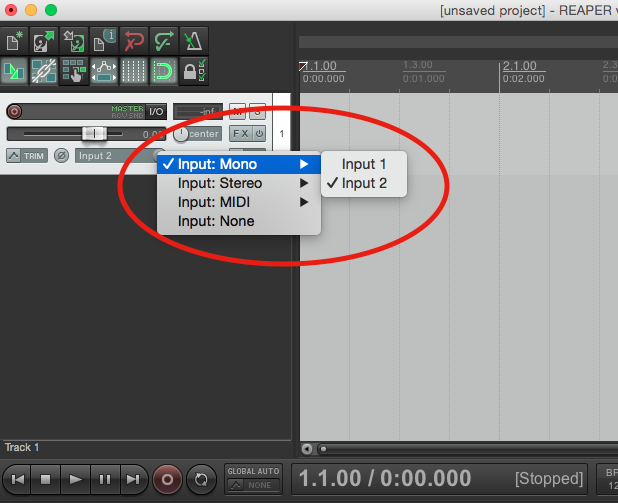 The following screenshots show how to select a track to record off input 2;"
So, now it now works perfectly ! Hi! A side question for those running the Focusrite Scarlett Solo 2nd Generation on Linux: is it suitable for a reasonably low latency live usage (with a guitar for example)? I have heard about a "USB Performance Mode" hardware setting, is it accessible from a Linux host? Thanks! timjrd wrote: Hi! A side question for those running the Focusrite Scarlett Solo 2nd Generation on Linux: is it suitable for a reasonably low latency live usage (with a guitar for example)? I have heard about a "USB Performance Mode" hardware setting, is it accessible from a Linux host? Thanks! All the Scarletts run fine. I have a Solo, 2i2 and 2i4.The latency depends on the plugins/software. I can go down to a buffer size of 32 without xruns when I play music only. For use with DAWs a buffersize of 128 or more is recommended. That's kinda acceptable for live play with synth plugins. Next weekend I'll try one of my Scarletts with my new Squier Strat (140 EUR with humbucker and 2 single coils) and Guitarix. Let's see how it feels and how far I can go down with the buffer size. bluebell wrote: Next weekend I'll try one of my Scarletts with my new Squier Strat (140 EUR with humbucker and 2 single coils) and Guitarix. Let's see how it feels and how far I can go down with the buffer size. Great news! Please let me know if it's acceptable for you. All the Scarletts models share the same latency performances right? I'm about to buy a Moog Etherwave Standard Theremin and I'm investigating the use of VCV Rack to add some effects (I've done some tests with a clean record and it sounds really promising!). My CPU is quite powerful and I think it's much cheaper and versatile to do this in software rather than to buy a lot of hardware. Scarlett Solo with -n3 -p32 runs perfectly with Guitarix on my notebook with Core i7. I haven't tried CPU-hungry stuff like convolvers yet, just amp, tone control and cabinet. I like the sounds. I couldn't notice any differences regarding CPU load and latency between 2i4, 2i2 and Solo. All work fine. The 2nd gen models work better with "hot" instruments.